This small province has contrived to give Argentina two of its three Peronist presidents of the 20th century – María Estela ‘Isabel’ Martínez de Perón and Carlos Saúl Menem (currently one of the three senators in his 89th year). 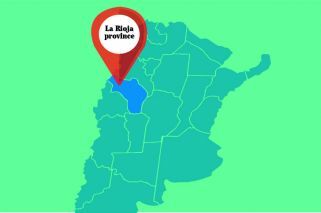 Only two provinces into this series and the queue-jumping starts already – strictly speaking, according to this column’s basic criterion of ascending order of magnitude, La Rioja’s turn should be next Saturday as the country’s third-smallest electorate but last weekend’s controversial plebiscite has stolen the limelight. Most critics of this plebiscite fail to identify correctly its worst aspects – not so much the relatively modest ambition of Governor Sergio Casas for a second term (hitherto barred due to occupying the bottom half of the 2011 gubernatorial ticket since the provincial constitution forbids three successive candidacies) as the outrageous ‘heads I win, tails you lose’ voting rules. To block the re-election (duly rubber-stamped by the provincial assembly just before Christmas) the opposition not only had to win the plebiscite but muster at least 35 percent of the electorate in the dead of summer. A restriction not binding on approval, which triumphed with less than a quarter of the electorate (some 69,000 votes to 44,000 in a 45 percent turnout with rejection narrowly ahead in the capital). Two days beforehand the Supreme Court issued a last-minute ruling to allow the plebiscite, pleading respect for provincial jurisdiction, a distaste for resolving political differences in the courtroom but, above all, an inability to rule on something yet to happen. Now it has happened, thus placing the ball back in that (supreme) court. La Rioja’s story begins exactly four cent ur ies before la st week’s subject Tierra del Fuego attained provincial status – founded in 1591 as a rare oasis within its arid region by Juan Ramírez de Velasco (a native of Spain’s La Rioja, a major wine province) commanding a Spanish military contingent of five officers, 85 soldiers and two civilians, among whom he divided the land. We can rapidly skip the colonial history (including a brutally crushed indigenous rising in 1630 and the introduction of 500 African slaves by the local Jesuits) to see La Rioja as one of the 13 original United Provinces of the River Plate in 1810 with around 14,000 inhabitants. Decades of anarchy followed under such colourful mavericks as Facundo Quiroga (assassinated in his stagecoach in 1835) – the “tiger of the plains” and an icon of gaucho barbarity according to Domingo Faustino Sarmiento – and his heir Angel Vicente ‘Chacho’ Peñaloza (an early Montonero in constant rebellion against the centralism of Bartolomé Mitre, whose troops lanced and shot him while surrendering in 1863), although the scholarly Joaquín Víctor González (1863-1923), a keen freemason and the founder of La Plata University, is an entirely contrasting figure. Even if the 1871-1895 quarter-century was relatively stable (with no less than seven governors completing their three-year terms), the introduction of democracy in 1916 brought no calm with 13 different governors or federal trustees during 14 years of Radical continuity at national level. The ensuing coup-ridden half-century (1930-1983) obviously ensured continued upheavals with 39 different heads of La Rioja in that period. This small province has nevertheless contrived to give Argentina two of its three Peronist presidents of the 20th century – María Estela ‘Isabel’ Martínez de Perón and Carlos Saúl Menem (currently one of the three senators in his 89th year). The latter marks a watershed in provincial history – since his first term in 1973, La Rioja is one of five provinces whose governors have always been Peronist. The only president to govern Argentina throughout a decade (1989-99), the Anillaco-born Menem would obviously warrant a column in his own right but this is a provincial not a national column. However, Menem is not even La Rioja’s longest-serving governor (nine years in total) – that record goes to his previous mining secretary Angel Maza (1995-2007), who ended his third term eight months early under Kirchnerite pressure to be replaced by his lieutenant-governor Luis Beder Herrera (2007-15), the other important governor of recent history and currently at daggers drawn with Casas. As for the parliamentary representation, not much attention will be given to the three senators (the Peronist Menem and Julio César Martínez and Olga Brizuela for Cambiemos) since they will not be facing the voters until the next presidential election in 2023 – the Radical Martínez, from Chilecito, was defence minister in Mauricio Macri’s first Cabinet in 2015 until shunted off to the Senate in 2017. Martínez can boast the rare feat of having carried this eternally Peronist province for Macri in both the 2015 runoff and the 2017 midterms (presumably seeking a hat-trick at the expense of Casas this year), despite which the governor probably sees him as less of a rival than either his predecessor Beder Herrera or the anti-plebiscite Peronist provincial capital mayor Alberto Paredes Urquiza (who is on smooth terms with Macri). La Rioja is one of 10 Argentine provinces with the minimum number of five deputies (Julio Sahad and Karina Molina of PRO, together with Radical Héctor Olivares back Macri’s government, while Peronists Beder Herrera and Danilo Flores are in opposition) – the terms of Beder Herrera, Molina and Olivares expire this year. The Peronist list of candidates would depend heavily on the degree of understanding achieved with Kirchnerism although Beder Herrera would be hard to dislodge (unless he somehow ends up displacing Casas as gubernatorial candidate) – less so either Molina or Olivares. As with any province, we must await the final verdict of the voters but before that a Supreme Court which dodged an opinion on last Sunday’s plebiscite on the grounds that it had not happened owes us an answer now that it has.